HOME > RESERVATIONS AREA > How can I create an offline Reservation? 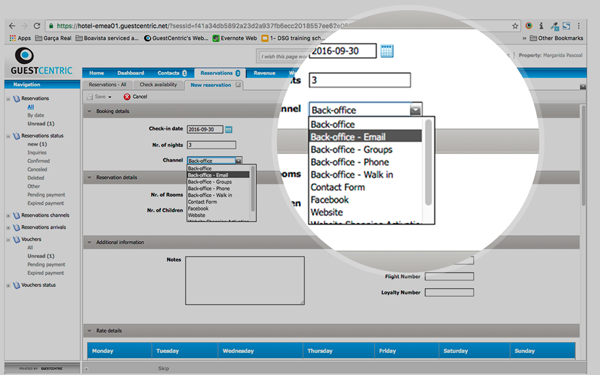 The hotel has the possibility to create a backend reservation with a different channel than just "Back-office". This will allow the hotelier to better detail back-office reservations. STEP 1: First you need to go to the RESERVATIONS tab and click on NEW RESERVATION. STEP 2: Select the relevant dates on the calendar and the desired room type from the availability list and click on MAKE RESERVATION. STEP 3: Insert the reservation details and on the GUEST INFORMATION area look up if this guest is already on your database, just by entering its name. If not, you can create a NEW GUEST. The fields highlighted in red are mandatory. Therefore you will need the Guest's first and last name and an email account to which the confirmation will be sent. STEP 4: Click SAVE AND CLOSE and the reservation will be complete from that moment on, which will now work like a normal reservation made on the booking engine. When selecting an OTA as a channel, please bear in mind, then you will not be able to edit or cancel this reservation later.